Tim Nielsen Lied to Me! 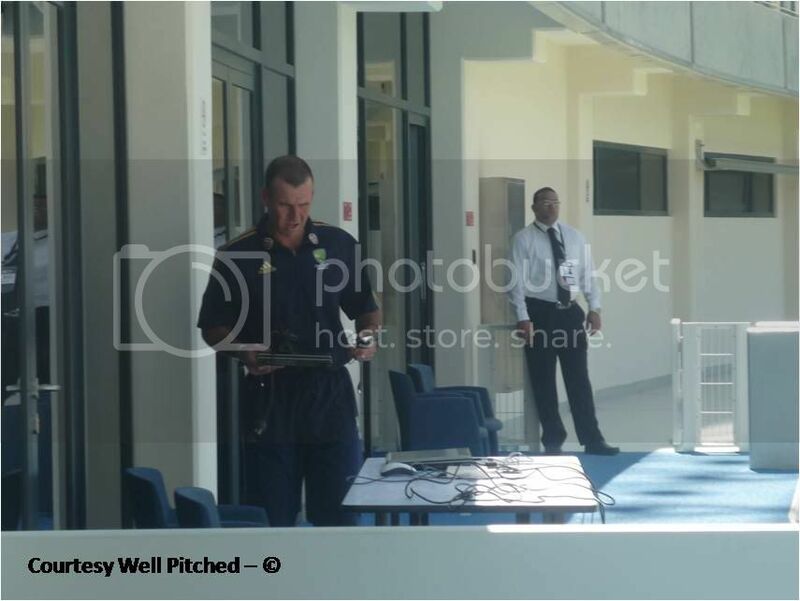 When the Australians arrived at the Dubai Sports City Cricket Stadium, I was in the photographers area making sure the clickers were settling down alright. The area dedicated for the photographers was right next to the Australian players' lounge. While I was going through my motions, out walked Tim Nielsen to set up his laptop in the position that would be his for the rest of the day. I clicked him and then walked up to say hello. After exchanging a few pleasantries I enquired, "So Marsh and Watson opening today?" Nielsen's response was, "Yeah, they are", to which I replied, "Thats great! Its good to see them back playing for Australia." He said that it definitely was. We shook hands and I went back upstairs to the media room. A couple of minutes before the start of the Australian innings, I walked back down to the photographers area to witness the first over from close-by. As I looked left, I couldn't believe what I saw. It was Marsh and Haddin walking out to open the innings! With Watson padded up, sitting, and not going anywhere. I was slightly disappointed not to see Marsh & Watson open, but I was very disappointed with Tim Nielsen. Mr. Nielsen, if you're reading this I want to assure you that I am not a bookie, I do not gamble, and I am definitely not a spy for the Pakistan team. To prove that you can ask my readers and they'll tell you what a big fan I am of Marsh & Watson at the top of the order. Afridi was on fire. The flight, guile, drift and variation he bowled with was exceptional as demonstrated in those bowled dismissals. Credit to Ajmal who also bowled mysteriously and economically. After all the criticisms we raised over his selection he proved to us that he is “international cricket material” and can make an impact after all. A victory is a victory but Pakistan should learn from that late onslaught which was conceded. On another day the margin could have been the difference between a win and defeat. He's just a dirty liar, Q. There's nothing you can do about it. Sad, but true. Yeah, I was waiting for him at the press conference after the match but he never turned up. Micheal Clarke came out alone with the media manager..
Great stuff. But I'm alarmed at the size of Tony Greig's head. It's twice the size of Afridi's. And Afridi's head ain't that small, is it? You're right Old Batsman. Tony Greig is HUGE... even the tallest and biggest of men look tiny in front of him. strategy change mate. last moment strategy change. And you term me a Hater. Hater for calling Pakistan not so strong team. Alright. i accept it. But then didnt your team lose 1-2 to SL in home series ? It was a series played in Pakistan and they lost it. Now you decide if I call them a strong team or not so strong team.